It's big. It's exciting. It's been years in the making. It's Disney's NEW Star Wars: Galaxy's Edge. This new futuristic land will cover over 14 acres in Frontierland and is the largest single-themed area ever built in Disney's parks. 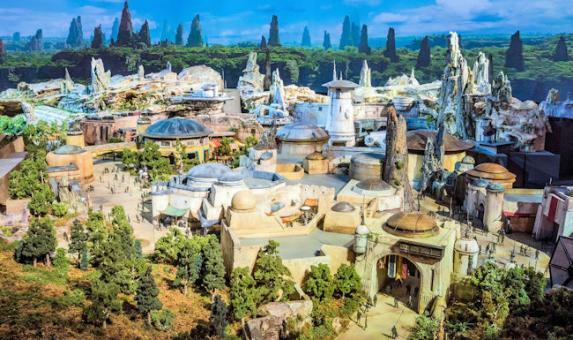 Debuting in Cailfornia on 31 May 2019 and 29 August in Walt Disney World Resort Orlando, you can visit Black Spire Outpost, the village within Galaxy's Edge, located on Planet Batuu. Visitors to the planet will be able to board the Millennium Falcon and become part of the cockpit crew blasting off into hyperspace! Batuu's other ride is the space ship "Star Destroyer" where you prepare for battle between the resistance and the First Order. To include this thrilling theme park in your tailor-made holiday to California or Florida contact the USA experts (and Star Wars fans) at Bon Voyage.